Some time ago I was asked to build a couple of tile-top end tables for a customer. She wanted them made from alder she had stored in her garage. 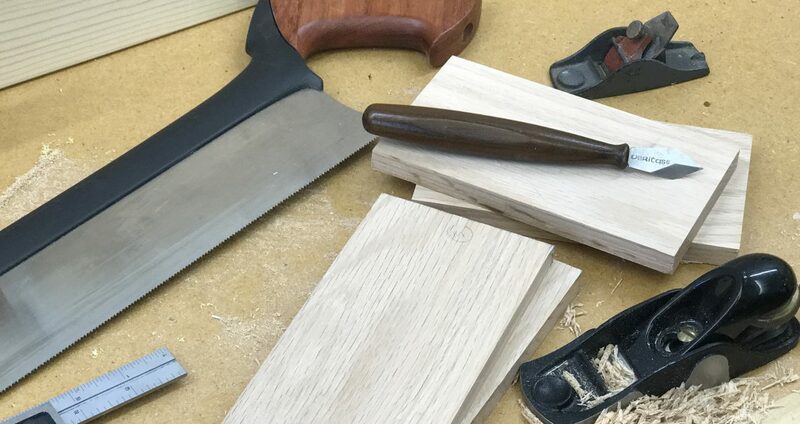 I had never worked with alder, but I have to say, it’s a dream to work with hand tools. After building the two tables and grouting the ceramic tiles for the tops, I applied several coats of General Finishes Arm-R-Seal to the base and top frame. I’m not one for staining or dyeing a finish unless the project warrants it or it’s figured wood. This customer also had a tile-top coffee table that someone else had built for her. After she saw the beauty of the clear oil finish, she decided she’d like to have her coffee table refinished. This table was built by someone who was apparently new to woodworking. I’ll let the photos below tell the story. Check out the fit of the tenons in the mortises. And the uneven finish with runs and drips. The gap around the drawer front was large enough to drive a car through (can’t do much to fix that). The drawer box was so shabbily built that I’ll have to build a new one (I’ll use Baltic birch plywood). I decided it would be quicker and easier to disassemble the table by cutting the aprons off, planing the finish off, then re-assembling the table. The apron/leg assembly with the top removed. Cutting the aprons off of the legs at the table saw. Poorly fitting tenons in the mortises. The groove for the drawer bottom was too wide, so a piece was used to fill in the extra space. Not only was this a poor piece to use because of the knot, check out the oversize groove and the dowel pegs. Did I tell you how much I hate finishing? I have a small shop. It resides in my garage. I don’t have room or the resources for a “finishing room.” So my choices for finishing boil down to those I can wipe or brush on. But I’ve never had much success with brush-on finishes either. I remember in my younger years watching my dad lay down a flawless finish using a brush. Back then, he used a lot of oil-based polyurethane finish (for kitchen cabinets, mostly). He learned the art of maintaining a wet edge, not brushing the finish once it’s laid down, and all the other techniques that are more art than science. My experience, however, with the same finish was…ugly. Brush strokes and dry areas where there was no finish was the norm for me. I could never get the knack of it.